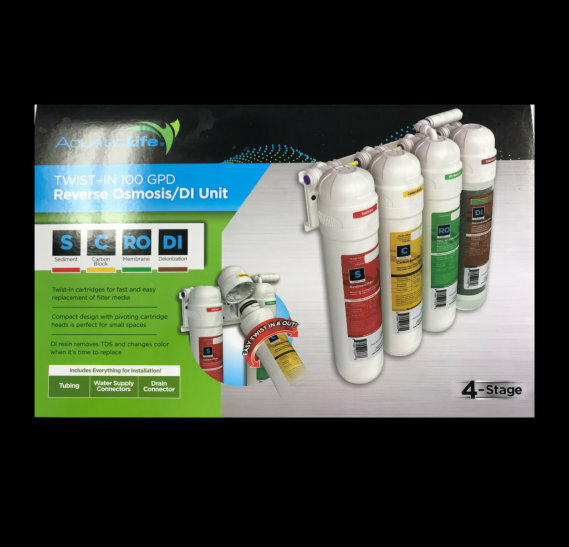 The Aquatic Life Twist-In 100gpd 4-Stage Reverse Osmosis Deionization (RODI) filtration systems are very compact water purification solutions that efficiently combine reverse osmosis RO and DI technology with our quick and easy to change twist-in replacement filter cartridges. The new twist-in media cartridge design makes filter changes simple, easy and clean – no tools required and no mess! The twist-in cartridges can be easily changed in only seconds with just a quarter turn and without contact with used filter material, and the supply water to the unit does not have to be turned off to replace any cartridge. 100 GPD 4-Stage RODI System (540371). Reverse Osmosis is the process of removing contaminants from tap water using a special semi-permeable membrane. By applying water pressure across the membrane, contaminants are concentrated on one side of the membrane and filtered water on the other side of the membrane. This is why Reverse Osmosis units have a waste water line as well as a filtered line. In addition to the membrane, water is filtered prior to the membrane with a sediment cartridge to remove larger particulates, and a carbon block to remove chlorine and other materials. After water is filtered by the membrane, it passes through a color-changing resin cartridge where additional Total Dissolved Solids (TDS) are removed from the water. The cartridges and membrane on your unit are designed for easy installation and replacement. Each cartridge connects to the filter housing by simply inserting and twisting. It is important the cartridges be installed in the correct order to effectively filter the water. STAGE 4 – TWIST-IN MIXED BED COLOR CHANGING RESIN DEIONIZATION CARTRIDGE: Replace filter when resin changes color completely to amber. When all resin has changed color, it is time to replace the DI filter. Item 330380. STAGE 1 – SEDIMENT FILTER Recommended change 6 months The first stage of your RO/DI unit is a five micron Sediment Filter that traps sediment and other particulate matter like dirt, silt and rust which will affect the taste and appearance of your water. STAGE 2 – CARBON BLOCK FILTER Recommended change 6 months The second stage of your RO/DI unit is a Carbon Block Filter. The activated carbon in the filter reduces chlorine and conditions the water prior to the RO Membrane. STAGE 3 – RO MEMBRANE Recommended change 2 Years The RO Membrane reduces impurities known as Total Dissolved Solids (TDS) from the water down to 1/10,000 of a micron, reducing arsenic, lead, parasitic cysts, copper and more. Because the process of filtering the high quality water takes time, it is common to use a storage tank to collect filtered water, making it available on demand. STAGE 4 – COLOR CHANGING RESIN (DEIONIZATION) Replace filter when resin changes color After the water is filtered by the membrane, there is usually a small amount of Total Dissolved Solids (TDS) left in the water. In certain non-drinking water applications, it is important to remove the remaining TDS from the water. This is accomplished by filtering the water through a resin that is charged with Cation and Anion resins (H+ and OH-). As the resin absorbs the TDS, it will change color. When all resin has changed color, it is time to replace the DI filter.